With a sludgy sound made more confrontational by an echoey production, it only takes a minute or so before the band’s chief musical interests are apparent. ‘Imperii Exsulses (Galactic Viatores)’ is classic doom metal with riffs that very much take cues from the Sabbath debut and then put them through a nineties stoner filter, resulting in something that often sounds like a very low budget Electric Wizard. For the next eight and a half minutes the riffs crawl and grind and a particularly punchy bass drum is almost the only thing which stops them slowing down even further. The track’s vocals are decidedly iffy, meaning that any highlights all come from the instrumental breaks where guitarist Don Cole disappears down a rabbit hole of fuzzy blues, often giving the music hints of Witch Mountain. The quieter second half of the track is more interesting than the first, applying blues guitar and spacious rhythms to a world of sounds like could be a cross between early Spirit and Blue Cheer. Once the main groove has been established here, the lead bass and crashing drums steer the guitar work into some dark places, indeed. Unfortunately, Stewart’s lead vocal continues to be so unfocused and waily, it pretty much detracts from the should-be enjoyable sound. No attempt has been made to retake performances where he goes dramatically off-piste, and while the live sound often works to stoner rock/metal’s advantage, his voice is so bad in places, you might not make it any further than the opening track. Bringing in more sludge, ‘Hybrid Genus Serpentis’ is the disc’s heaviest track – and the deeper sound very much suits Negative Wall. Trying a bit less to impress with an old power trio approach, instead, Negative Wall fall into something that sounds like a blend of Sabbath, Alice In Chains and…something played at the wrong speed. It isn’t brilliant, but since the musical goals are more obvious, it’s easily the best track. Adopting lower vocal registers, Stewart actually works with the band and not against it, while some heavy blues emerges from the lead guitar…which, in turn, is often trying to fight its way out of a musical swamp. In the rear of a deep and echoing mix, drummer Dennis Reid (also of Bludy Gyres) smashes the hell out of his toms, often concerned with heavy beats as opposed to any flashy grooves. 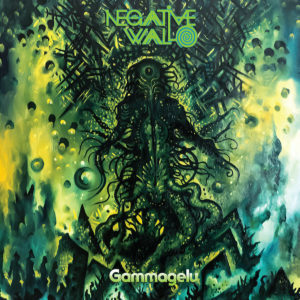 By the time the track reaches a climax with muddy sounding guitars and a repetitive heavy beat, it’s obvious that Negative Wall have truly peaked. Using a slightly eastern tuning on the guitar and a more percussive approach for the rhythm section, the intro to ‘Master Saeva 22’ sounds like a metal equivalent of a film score for a desert scene, and while it isn’t anywhere near as inventive as the Egyptian influences scattered throughout Akenhaten‘s release from 2018, it’s good to hear this trio experimenting and stretching out a little. It doesn’t last, though; soon enough, a slow and oppressive mood takes hold as Don cranks an incredibly slow riff. You’ll easily find better examples of similar sounds from a hundred other bands, but for those coming to this release as very curious doom devotees, it’ll be one of the stand-out moments, especially with the drums pushed higher into the mix. The next few minutes waver between low budget doom metal and low grade sludge that sounds as if you’ve blown your speakers. It’s only the occasional blues tendencies that lighten the mood…and even then, not by much. If you love really heavy blues, it’s worth an inquisitive ear, but it’s only really worth hearing the once…and as before, it probably would’ve made a better instrumental. Very much in keeping with Tommy’s own material, a cover of Electric Wizard’s ‘Torquemada 71’ fills the listener’s ears with slow and brutal riffs. If there’s any drawback it’s the vocal, yet again: faced with something written by someone else, Stewart wails and shrieks like a doom laden karaoke demon, potentially derailing a half-decent idea. After a couple of minutes, he starts to sound a touch better, but it’s still not a great vocal take. Thankfully, huge bluesy guitars and commitment to a riff suggest that somewhere within this self-made world of sludgy sounds and wobbly vocals, there’s a decent band desperate to escape. By the time Reid really hits his stride and launches into a busy solo, it’s much easier to forgive any of the performance’s short-comings. With very flawed performances and a lo-fi mix, this is very much a record that’ll only appeal to the most obsessive doom fan. Unfortunately, though, with so much genre competition out there, Negative Wall possibly aren’t likely rise beyond being local cult heroes. While there are glimmers of potential goodness, in the main, ‘Gammagelu’ just all too often sounds like something that was released long before it was ready for public consumption. This entry was posted in Album & EP Reviews and tagged atlanta, doom metal, electric wizard, metal, negative wall, sludge metal, stream, tommy stewart by Real Gone. Bookmark the permalink.